In 2011 the FDA approved the drug Nulojix (belatacept) for the prevention of graft rejection after kidney transplants. Christian P. Larsen, Emory University, provides a nutshell explanation of how the drug works, how it might impact kidney transplant patients and what type of work went into the drug's development. Christian P. Larsen, MD, DPhil, an internationally recognized leader in transplant surgery and immunology, has been named dean of Emory University School of Medicine. He also will serve as vice president for Health Center Integration for the Robert W. Woodruff Health Sciences Center and as chairman of the Board of Directors of The Emory Clinic. Larsen will assume these roles effective January 15, 2013. Larsen is currently chair of the Department of Surgery at Emory University School of Medicine, director of Surgical Services for Emory Healthcare and executive director of the Emory Transplant Center. He also is an affiliate scientist at Yerkes National Primate Research Center. He holds endowed positions as the Joseph Brown Whitehead Professor of Surgery and the Carlos and Marguerite Mason Professor in the Emory School of Medicine. "I am delighted to announce that President James Wagner and the Emory University Board of Trustees have accepted the recommendation to appoint Dr. Christian Larsen to lead Emory University School of Medicine," says S. Wright Caughman, MD, Emory executive vice president for health affairs and CEO of the Woodruff Health Sciences Center. "Over 22 years as an Emory faculty member, he has demonstrated his skills as an outstanding surgeon, scientist, teacher and colleague, and most important, as a respected leader with the integrity and vision to build innovative new models of integrated patient care. He has excelled at moving medicine and care delivery forward, not only at Emory, but on a national level." Larsen succeeds Thomas J. Lawley, MD, who retired from the deanship this year after 16 years in that position and will remain a medical faculty member. The Emory University School of Medicine is currently ranked 16th nationally in National Institutes of Health (NIH) research funding. The school has more than 14,000 alumni, and one of every four physicians in Georgia trained at Emory. "Dr. Larsen is widely recognized for his scholarly accomplishments, his skills as an innovative surgeon and for his role as a devoted member of the Emory community," says James Wagner, president of Emory University. "He will bring his inspired brand of leadership to the School of Medicine and will build upon the rich legacy of this vital institution." 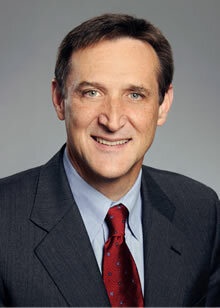 Larsen joined the Emory School of Medicine faculty in 1991 and was appointed chair of surgery in the medical school and director of surgical services for Emory Healthcare in 2009. His clinical practice is focused on kidney, pancreas and islet transplantation at Emory University Hospital and Children's Healthcare of Atlanta. Larsen became founding director of the Emory Transplant Center (ETC) in 2001, building and directing one of the foremost research and clinical transplantation programs in the world. The center is most noteworthy for its leadership in the early integration of clinical care and research. Under Larsen, the ETC has been a national pacesetter in establishing new standards to ensure reliable, patient-centered care, focusing on multidisciplinary care a full decade before its recognition as an essential attribute in patient care. In addition, the ETC has been one of the nation's leading centers for NIH research funding in basic immunology, in translational studies in non-human primates and in large, multi-center clinical trials. "Dr. Larsen is a nationally and internationally recognized leader in development of multidisciplinary, patient-centered care," says John Fox, president and CEO of Emory Healthcare. "Thanks to his leadership, the Emory Transplant Center is a model for the integration of researchers, physicians, nurses and staff, all for the benefit of our patients. In his role as vice president for Woodruff Health Sciences Center Integration, we will work closely in our drive toward greater collaboration among Emory's vast resources in medical training, research and clinical care." Together with long-time collaborator Thomas Pearson, MD, DPhil, Larsen has played a pivotal role in discovering a new class of immunosuppressive drugs known as co-stimulation blockers. Larsen and Pearson helped drive the development of the co-stimulation blocker belatacept, approved in June 2011 by the U.S. Food and Drug Administration for kidney transplant recipients – the first time a new class of drug had been approved for transplant since the 1990s. In 2012 Larsen received a new NIH grant for nearly $20 million to lead a research team continuing development of more effective co-stimulation blockers for near-term treatment of transplant patients and better strategies for the "holy grail" of transplantation – long-term, true immune tolerance of transplanted organs. Larsen has been continuously funded by the NIH for the past 16 years. The recipient of a prestigious NIH MERIT award, he has directed program project grants, center awards, and multi-institutional consortia funded by the NIH and Juvenile Diabetes Research Foundation. After receiving his bachelor of arts in chemistry from Emory College, Larsen received his medical degree from Emory University School of Medicine in 1984. He was a Livingston Surgical Research Fellow at the University of Oxford, England, and he received his doctor of philosophy in transplantation immunology from Oxford in 1990. He completed general and transplantation surgery training at Stanford University and Emory, where he was chief surgical resident and a fellow in transplantation surgery. Larsen is a Fellow of the American College of Surgeons and an elected member of the American Society for Clinical Investigation, chair of the NIH NIAID Non-Human Primate Tolerance Network and a member of the NIH Clinical Islet Transplant Consortium Steering Committee. He is the recipient of both national and international research awards, including the Basic Science Award of the American Society of Transplant Physicians (1997), the Roche Award (2001), the Roche Basic Science Established Investigator Award (2004), the Roche Award for Excellence in Translational Research from the American Society of Transplantation (2006), the Thomas E. Starzl Prize in Surgery and Immunology (2007), and the Emory School of Medicine's Distinguished Faculty Lecture and Award (2009). His scientific articles have appeared in high-impact journals including The Journal of Experimental Medicine, Nature Medicine, Journal of Clinical Investigation, Nature, The Journal of Immunology, Blood, Transplantation, Diabetes, and Proceedings of the National Academy of Sciences.